As more and more people consume media across multiple screens, device-based measurement has become increasingly inaccurate and incomplete. Thunder and TiVo recently partnered up to discuss some of the challenges with people-based measurement from TV to digital, and ways marketers are tackling this tricky problem. Applying traditional cookie- or device-based measurement approaches to these areas leads to imprecise, incomplete, and sometimes incorrect insights. As such, marketers have embraced People-Based Measurement as the new way forward. People-based measurement refers to the use of persistent identifiers to capture user behavior across channels and devices. This approach provides a more holistic view of user behavior compared with traditional cookie- or device-specific measurement. Here’s a simple video that explains the differences in approach. There are two common ways people-based measurement is done: panel-based measurement and direct measurement. Panel based measurement refers to the use of certain technologies that monitor how certain subgroups of individuals behave, and uses those observations to make general conclusions about the population. The advantage of this method is that you can make conclusions with far fewer data points. The downside, of course, is that your extrapolations are prone to sample bias and may be inadvertently distort reality. Direct measurement, in contrast, provides far higher accuracy. Unfortunately, this approach requires collecting more more data via a persistent identity, which is a technological challenge for marketers who do not have access to this type of technology. Both approaches of doing people-based measurement provide far greater accuracy relative to cookie- and device-based approaches. In a cookie-based world, ID’s are temporary rather than persistent, and impressions are subject to fraud, deletion, and blocking. In the device-based approach, each device may offer a persistent, unique identity, but one individual may have multiple devices. People-based measurement connects ad exposures across all environments – from open web to walled gardens, including linear and OTT video. Ad exposures can be connected to a persistent identifier, which can then be tracked against both online and online conversions. For example, TiVo’s data set includes exposures from three million active households across 210 DMA’s. Using TiVo and Thunder’s people-based measurement, the marketer can combine the data from television with data from open web and walled gardens to provide a true view of the customer journey. An increase in conversions that are ad attributed (which happens via events that are not tracked by cookies or devices such as offline purchases). Looking to make the transition to People-based measurement? There are two ways for marketers to embrace people-based measurement. The quick and easy approach is a Wrap & Measure test, which uses a people-based ad server to track your ad exposures, person counts, and digital conversions for a particular campaign, and provides a report on a particular campaign to see the people-based difference. The more comprehensive approach is the “Always-On” People-based ad serving, which uses a people-based ad server to track and personalize your message across all campaigns by person. Marketers using a people-based ad server switch from “per campaign” or “per channel” mindsets to “customer-centric” mindsets that focus more on customer journeys and lifetime customer value. Relative to the quick and easy approach, this more comprehensive approach can fill your data lake in real-time with people-based data. SAN FRANCISCO, Aug. 28, 2018 (GLOBE NEWSWIRE) — Thunder Experience Cloud, the leader in people-based ad serving, and Neustar Marketing Solutions (a division of Neustar, Inc.), the leading unified marketing intelligence platform for marketers, today announced the integration of Thunder’s people-based ad server with the Neustar Identity Data Management Platform (IDMP) and the Neustar MarketShare solution. The partnership will enable brands and agencies to quickly customize ad creatives to each customer, as well as measure performance for real-time optimization. Thunder’s dynamic creative optimization (DCO) solution is a people-based, dynamic ad server that enables advertisers to factor in data signals such as CRM, weather, device type, time, media exposure, and now, audience data from large Data Management Platforms (DMP) like Neustar. In addition, Thunder’s people-based Experience Measurement solution tracks the performance of ads from exposure to viewer to conversion to allow for a high level of optimization. From there, joint customers can quickly and easily activate media by person tracked on the open web through the Neustar IDMP. This people-based data set will also be integrated within the Neustar IDMP and the Neustar MarketShare solution. Note: We provided an overview of Ads Data hub in Part 1, and how Ads Data Hub will impact DMP’s in Part 2. This post covers data lakes and how analytics will be impacted in the Ads Data Hub world. 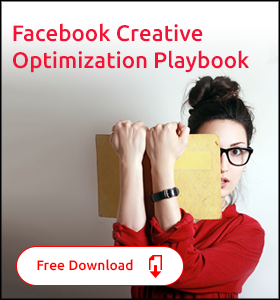 What customer segment is most responding to my ads? Which ads are leading to the most amount of lifetime customer value? Do people who see my ads spend more with me? Am I spending more money to reach my customers than they are spending with me? Brands have staffed up data analysts and data scientists to make sense of all this data and answer these important business questions to improve strategy and validate what partners are telling the brand. Data lakes ultimately rely on data to flow into them. Google’s recent changes with Ads Data Hub keeps data locked within Google Cloud and cannot be combined outside of Google’s controlled environment. As a result, data lakes for marketing are under threat by recent changes by Google. Consequently brands with sensitive customer data are forced to decide whether to upload that data to Google to run in a Google-controlled data lake or keep it off the Google Cloud where they’ll need to find other vendors to solve their needs for tracking, analyzing, and modeling. If you want to maintain control of your own data lake and preview it from drying up, talk to Thunder about our Experience Measurement solution. What is Google’s Ads Data Hub and is it right for me? Note: We provided an overview of Ads Data hub in Part 1. In this post, we look at how Ads Data Hub will impact DMP’s in general. Data management platforms (DMPs) power the marketer’s ability to track, segment, and target audiences across programmatic media. Leading DMP solutions include Salesforce DMP (previously known as Krux), Neustar IDMP, Oracle BlueKai and Adobe Audience Manager. If you weren’t paying close attention, you may not realize that the changes Google have announced have blown a hole in your DMP. Two major capabilities are affected by the pending DoubleClick ID removal from logs and push toward using Google’s Ads Data Hub: (1) segmentation and (2) frequency capping. First, marketers currently use DMPs to create new audience segments based on media exposure. A DMP can keep track of media exposure if its own tags/pixels can run with the ad, but on many publisher inventory such as Google’s Ad Exchange, DMPs are banned from running their code. These publishers are worried about data leakage, which happens when the DMP pixels proprietary audiences on media (such as sports lovers on ESPN.com) and purchased these users elsewhere without paying the publisher. Historically, the DMP could still get a record of media exposure from the ad server such as DoubleClick, which would share data on who saw the ads running. Using DoubeClick’s data, the marketer could then still segment audiences within the DMP based on who saw the ad, who converted, etc. Now that Google has discontinued the sharing of logs with IDs, DMPs are no longer able to see media exposure on either inventories on which they are explicitly banned and or inventories where they are allowed to operate but that Google’s DoubleClick ad server is used by the advertiser. If DMPs are to continue to be useful to the marketer, they will need a new source of data. Second, some marketers use DMPs to create frequency caps across media platforms. By getting their pixel/code to run with an ad, or by ingesting ad serving logs, DMPs can count impressions exposed to a particular user ID and then send a signal to platforms like DSPs to stop buying a user after a certain amount of exposure. However, without log level data, DMPs will not be able to count frequency for inventory in which they are banned, leading to less accurate frequency measurement and therefore less precise frequency capping. How do I keep my DMP running at full performance? Marketers who have invested in a DMP and want to keep its capabilities at full power would be advised to either buy more digital media that allow DMP tracking or find an alternative ad tracking or serving solution that can data transfer log files to the DMP. A combination of these two strategies would allow a brand to continue using its DMP to its fullest by giving the DMP the complete picture of ad exposure tied to person. If you want to add an independent ad tracker to your DoubleClick stack or to keep powering your DMP with data, talk to Thunder about our Experience Measurement solution. 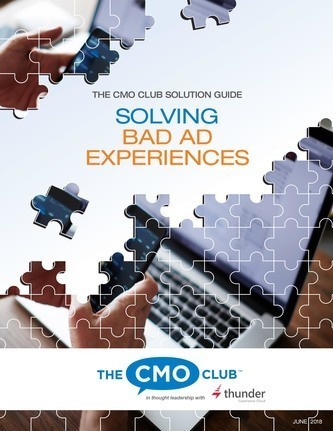 CMP is the hot adtech acronym of 2018. There are actually two meanings to this term: (1) Creative Management Platform and (2) Consent Management Platform. Here’s an overview of both these products and why you may need one. 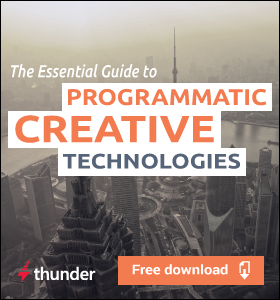 Introduced in 2016 by Thunder, the CMP acronym original stood for “creative management platform,” a tool for producing and trafficking ad creatives. Rather than just a general purpose creative editor like Adobe Photoshop or Animate, which are applications built for a single designer to use by him or herself, CMPs are meant for an enterprise that has a scale issue with creative. 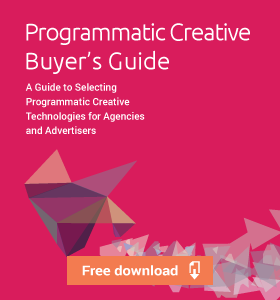 Many brands, agencies and publishers are increasingly needing to build ads in different sizes and versions for different audiences and media formats. Consequently, creative production demands have grown exponentially while most creative organizations can only scale linearly in their capability by adding more designers and programmers. Because traditional creative editors were built for highly advanced users, a creative bottleneck formed as demand went up and not enough talent or payroll existed to fill the void. Creative Management Platforms radically simplified ad production by providing easier interfaces and automated production tasks like re-sizing. 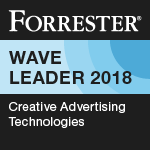 Forrester began recognizing CMPs in 2017 as part of their broader creative ad tech research which has been timed with the rise in enterprise demand for new marketing creative technologies. Introduced in 2018, the new CMP acronym stands for “consent management platform.” The European privacy laws known as GDPR required publishers and marketers to obtain explicit consent for certain tracking and targeting data. As a result, a new category of tools emerged to specifically help these enterprises collect and keep track of user consent. The CMP then feeds that consent information tied to an ID to other selected partners in the digital advertising supply chain. As a result, every party in a publisher’s supply chain understands what data they may use and for what. Which CMP do I need? It depends if you’re looking to solve a creative problem or a data privacy problem. Talk to Thunder if you need help with your data-driven creative problems or digital creative production problems. Check out these consent management vendors if you’re looking to solve a privacy preference problem.